Ensure worldwide availability of equal quality oil while reducing the duplication of a large number of internal GM engine oil specifications, replacing GM specifications GMLL-A-025, GM6094M and GM4718M. dexos™1 also is backward compatible for older vehicles; however, the owner manual oil specification in prior model years remains acceptable. The dexos™ specification includes two classifications. GM will require dexos™1 for global factory fill in spark ignited engines worldwide and service fill for gasoline engines worldwide. It will replace the GM6094M specification for most GM gasoline engines. dexos™2, required for diesel engines as well as a service fill for gasoline engines in Europe, was introduced in Europe late last year. In addition to GM dexos™, a new International Lubricants Standardization and Approval Committee (ILSAC) standard, GF-5, was introduced in 2010. There is a new API engine oil service category – SN Resource Conserving. The current GF-4 standard was put in place in 2004. The GF- 5 standard will use a new engine fuel economy test, called Sequence VID (six D), which provides a statistically significant increase in fuel economy versus the Sequence VIB (six B) test that was used for GF-4. Like dexos™, the new ILSAC GF-5 standard will call for more sophisticated additives. It’s expected that all dexos™1 approved oils will meet GF-5. However, not all GF-5 engine oils will necessarily meet the dexos™ specification. Since CAFE standards were first introduced in 1974, the fuel economy of cars has more than doubled, while the fuel economy of light trucks has increased by more than 50 percent. Proposed CAFE standards call for a continuation of increased fuel economy in new cars and trucks. To meet these future requirements, all vehicle operation aspects are being looked at more critically than ever before. New technology being introduced in GM vehicles designed to address vehicle efficiency and fuel economy include direct injection, cam phasing, turbocharging and Active Fuel Management. The demands of these technologies on engine oil also are taken into consideration when determining new oil specifications. Active Fuel Management, for example, can help to achieve improved fuel economy, however, alternately starting and stopping cylinders puts a lot of stress on engine oil. To meet tough fuel economy mandates, the industry will shift toward lower viscosity oils. Testing has shown that thinner 0W-20 oil, for example, can provide as much as a 4-percent improvement in fuel economy over 15W-40 oil. dexos™1 will be offered in these viscosities: SAE 0W-20, 5W-20, 0W-30 and 5W-30. dexos2™ will be available in SAE 5W-30, 0W-40 and 5W-40. Please check the appropriate vehicle owner manual for the proper viscosity grade. To help reduce the consumption of oil while maintaining proper engine protection, many GM vehicles equipped with the GM OLMS have a maximum oil change interval that is much longer than what was considered a normal interval just a few years ago. ACDelco News Page 3 If all GM vehicle owners follow the OLMS intervals in their vehicles as intended, GM estimates that more than 100 million gallons of oil could be saved annually. The second generation OLMS will rely on significantly more engine operating information than the current system, which, combined with dexos™ certified oil, could allow a significant extension of the maximum oil change interval. dexos™ specifications call for improved oil robustness to support extended drain intervals over a vehicle’s lifetime. When the OLMS determines that an oil and filter change is needed, the driver is notified by a Change Oil message on the instrument panel. The oil change should be performed within 600 miles (1,000 km). The OLMS must be manually reset when the oil is changed. 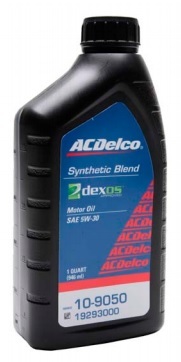 dexos™1 Availability: Currently, ACDelco Synthetic Blend dexos™1 5W30 engine oil is available through the GM Oil Program in 55 gallon drums (which can be pumped into bulk tanks). Quart-size packaged product is now available. Orders may be placed through your local ACDelco oil distributor http://www.jackmaxton.com. While not every area of the country experiences snow or even brutally cold temperatures, the fact is that summer and “all-season” tire rubber begins to lose its flexibility and ability to grip the road when the temperature drops below just 45 degrees Fahrenheit. Winter-specific tire rubber is specifically formulated to perform in colder temperatures, and winter tires also have added features and specific tread patterns to help maximize traction in poor driving conditions. 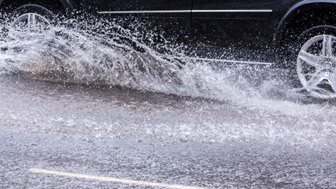 In addition, summer and all-season tire tread patterns are designed to channel away water; when it gets colder, those channels can get filled with snow or ice and slush, creating a dangerous situation. Winter tires feature tread “sipes” – tiny slits in the tread blocks that enable the tires to flex and rid themselves of the snow that packs in when you drive. Even on sheets of ice, winter tires will give you better traction than non-winter tires can provide. Winter tires are just as important on four-wheel and all-wheel drive vehicles in order to realize the benefits of the 4WD/AWD system; it doesn’t matter how many wheels are getting power if the tires they wear can’t hold the road. AutoExpress magazine compared two vehicles of the same make and model––one equipped with AWD and summer tires and the other a front-wheel drive model with winter tires––and the FWD/winter tire model simply outperformed the AWD model, specifically because of the difference in tires. A study done a few years ago in Canada saw accidents drop by five percent when winter tires were mandated, partially due to the fact that winter tires have been shown to help cut braking distances by as much as 30 percent. Some manufacturers recommend a specific make and style of winter tires for their vehicles. Ask your dealer’s service department for information about what is suitable and/or recommended for your particular make and model. A pair of proper winter tires can mean the difference between confident winter driving and potential trouble, and it’s not too late to make the switch. There are plenty of affordable choices available, and your dealer’s factory-trained personnel can help get your vehicle ready for anything winter brings. Many drivers don’t think much about their vehicle’s brakes unless they have trouble stopping. What does that squeaking, squealing or grinding really mean, though? The braking system is a complex collection of parts. Here’s a list of basic braking system components to help get you acclimated. Pads: The brake pads are what convert the kinetic energy of your moving wheels into thermal energy and actually bring you to a stop. When you press your brake pedal, the pads are squeezed against the rotors (more on those below) to slow and then halt the rotation of your vehicle’s wheels. Some pads have built-in wear indicators that produce a high pitched squealing when the pads need to be replaced. Making sure you get the right brake pads for your specific model is important to ensure even wear, proper stopping and minimal noise. Calipers: Brake calipers house the brake pads and are normally found in one of two types: floating or fixed. Dirt or corrosion can negatively impact caliper performance and can even cause them to stick, leading to the pads dragging on the rotors even when the brake pedal isn’t depressed. This can cause reduced fuel economy, overheating and excessive wear. Rotors: When you press down on your brake pedal, the pads clamp down onto the rotors (also known as discs) and stop the wheels from spinning. There are various kinds of rotors, including drilled and slotted, which provide less surface area than traditional solid rotors but help distribute heat and minimize wear. Brake rotors are as important as the pads. If you feel pulsing when you decelerate or your steering wheel shakes (sometimes extremely hard), your rotors may be warped. They should be inspected for damage and replaced if necessary. Brake Fluid: Hydraulic braking systems rely on brake fluid to convert the force you exert on the brake pedal into the pressure braking components exert on your wheels. Brake fluid also amplifies braking pressure. The Department of Transportation has several classifications for brake fluid––DOT 3 and DOT 4, for example––which reflect a fluid’s boiling point, viscosity and formulation. Consult your owner’s manual or your dealer’s factory trained technicians for information about the type of fluid recommended for your make and model and how often it should be changed. Brake Line: As most automobiles on the road today have hydraulic brake systems, they also have brake lines that channel the brake fluid to the brakes themselves. Air in brake lines or a ruptured line can cause complete brake failure, so brake lines should be periodically inspected by trained technicians to insure safe operation. Jack Maxton’s service technicians know the right parts to use for your specific make and model, so whether your brakes are squeaking, squealing, grinding or simply not stopping the way you want them to, the best place to go for brake system diagnostics and service is your dealership. You’ll never have to wonder if they’re using the right parts or the right tools, and you’ll have added peace of mind and confidence behind the wheel. What “Luxury Sports Car” was chosen as the best of them all by U.S. News, based on their independent analysis of published reviews and test drives, plus safety and reliability data? The all-new 2014 Chevrolet Corvette Stingray, available here at Jack Maxton Chevrolet in Worthington, Ohio. Better than anything from Germany or Japan or Great Britain; simply the best. Words like “dazzles,” “remarkable” and “breathtaking” have been thrown around with complete abandon by automotive writers everywhere, and the best part is that this great new Corvette is one of the most affordable sports cars to be found. The 2014 Corvette Stingray line offers coupe and convertible body styles, Stingray and Z51 models, and 1LT, 2LT and 3LT trims for both models. There’s also a Z51 Performance Package that can be added each of the three Z51 trims. The 2014 Stingray Coupe 1LT is a lightweight, high-precision two-seat sports car that embarrasses competitors costing many thousands more. An aluminum frame and the latest generation of the vaunted small-block V8 are at the heart of it all. This 6.2-liter V8 produces 455 hp and 460 lb/ft of torque, and it hurls the Stingray to 60 mph in just 3.8 seconds. The standard transmission is a seven-speed manual with Active Rev Matching and Launch Control. A six-speed paddle-shift automatic is available, and you can adjust it just the way you like thanks to selectable shift feel and shift points. A torque converter with reduced inertia improves shift quality and speed. Other 1LT features include all-new eight-way power adjustable seats, leather upholstery, Keyless Access and Push-Button Start, a power tilt/telescope steering column, a rear-vision camera, a body-color removable carbon-fiber roof panel, a carbon-fiber hood, a Driver Mode Selector, and a Bose® audio system with nine speakers and a three-month trial of SiriusXM Satellite Radio. 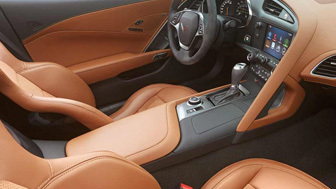 The Corvette Stingray Coupe 2LT (MSRP $57,210) is fitted with a variety of popular features and equipment, including heated and ventilated seats with lumbar/wing adjustment and seat emblems, seat position and mirror memory, Bose® premium audio, HomeLink universal remote, auto-dimming mirrors, a color head-up display, one-year SiriusXM subscription, a cargo net and shade, and an enhanced theft-deterrent package. In Stingray Coupe 3LT (MSRP $61,005), even more luxury is blended into the sport. The 3LT gets a custom leather-wrapped interior with Nappa leather seating surfaces. Navigation, which is available in 1LT and 2LT trims, is standard in the 3LT. The instrument panel in the 3LT matches the interior color, too. For high-performance lovers looking for the sharpest nail, there’s the 2014 Corvette Z51 (MSRP starting at $57,000). It’s the Stingray for the purist who wants the lightest weight possible. You get the same trims and features as above, plus the availability of the Z51 Performance Package. The Z51 Performance Package is all business. You get larger wheels in staggered 19-inch front and 20-inch rear sizes with Michelin® Pilot® Super Sport® summer tires; and a dry sump engine oil system to stand up to high performance driving. An electronic limited-slip differential is included, as are performance gear ratios, and there’s extra cooling for the differential and transmission, as well as HD cooling for the engine. The Z51 chassis rides on its own specific shocks, springs and stabilizer bars. Also exclusive to the Z51 is an aero package that reduces lift at high speeds to enhance stability. Larger, 13.6-inch diameter front brakes with black calipers and slotted brake rotors bring confident stopping to match the impressive acceleration. The Z51 Performance Package can be further enhanced with available Magnetic Selective Ride Control and Performance Traction Management. Available amenities include Competition Sport bucket seats, with solid magnesium seat frames that are lightweight and strong; and a sueded microfiber-wrapped steering wheel in a smaller, 14.1-inche diameter for performance driving. A sueded, microfiber-wrapped Upper Interior Trim Package richens the interior with a microfiber headliner, visors, A-pillar trim, trim above the windshield and rear window and around the quarter windows. The standard body-color carbon fiber panel can be replaced with a transparent removable panel or a Visible Carbon-Fiber panel with body-color surround. The Body Color Dual Roof Package includes both the transparent panel and the carbon-fiber panel, and the Carbon-Fiber Dual Roof Package pairs the Visible Carbon-Fiber panel with the transparent panel. Brake calipers in red or yellow give you options besides the standard dark gray metallic, too. The standard rear axle ratio for all Corvette Stingray trims is 3.42:1. This delivers a great blend of performance and economy. Available for 1LT and 2LT trims is a long-legged 2.56:1 limited-slip rear end that pairs with the six-speed automatic transmission. Z51 models offer an available 2.73:1 ratio with the automatic. The 2014 Chevrolet Corvette inspired AutoTrader writers to say, “You can certainly pay a lot more for rival sports cars, but it’s hard to imagine wanting more than what this revolutionary C7 ‘Vette provides.” See and drive the new Corvette for yourself, and be your own judge. Schedule your test drive today.